Perfect for couples, for families or friends. Stunning seaside apartment set within the coastal village of St Monans. Doon The Toon is 100 yards from the traditional fishing harbour (with the famously photographed breakwater as photo), and a few steps away from the general store and the amazing Diving Gannet cafe. 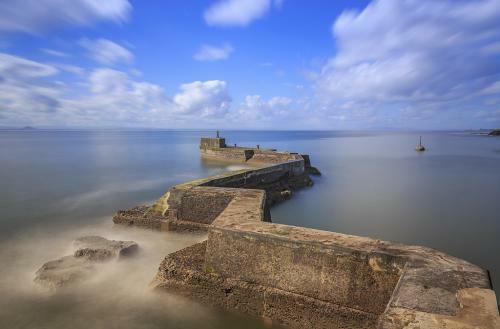 It is an ideal base for accessing Fife Coastal path, with Elie in one direction and Anstruther in the other. Our seaside apartment has recently been fully refurbished to offer a modern yet homely holiday home. There are a few steps from street level leading into the main building. The main hallway leads into the large sunny lounge, which offers a glimpse of the sea from the front window. The fully fitted kitchen leads off the lounge and offers a dining space. There is a large bright modern bathroom and two double bedrooms. Bedroom one offers a luxurious king size bed with quality mattress for a great nights sleep. Bedroom 2 has option of a king size bed or twin beds. Unless otherwise requested bedroom 2 will be made up as 2 x single beds. Guests have full access to the entire flat. Guests will be met on arrival with the keys and assistance is available from me 24/7 via mobile should assistance be required. We offer to you; Luxurious beds and quality mattresses with freshly laundered bed linen. Visit St Andews only 10 miles away or Edinburgh, Stirling &Perth within a 1 hours drive. There are 2 double bedrooms, offering king size beds (or twin option available), spacious bathroom, kitchen & lounge.